Kharlovka Report - Final week of the season ending 8th September. Over the last two weeks, time has slowed to a tranquil pace here above the Arctic Circle as the long white nights of summer have been replaced with thousands of stars and curtains of dancing green lights. 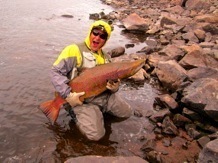 Along with all those cherished mushrooms and tasty blue berries, there were also a lot of large aggressive salmon about! The Russians call this brief magical period ‘Zolotaya Osen’ or golden autumn as spectacular red – yellow and orange colours highlight the far northern tundra. All charged up from their arrival to the Big fish rumors in the Murmansk airport, that were obviously left behind from the previous group, 9 ASR vets along with 4 excited rookies filed off the helicopter and swiftly scurried off to their cozy cabins to start fiddling with their flies. Moments later they were suddenly all gathered at attention back in the lodge. At first, there was a noticeable silence as they just stood there with their beers, starring in awe at the large salmon carvings scattered about the walls. We are pleased to report that the 3 Rivers program was a tremendous success this season! In fact, over the last 2 weeks, 18 of the 26 fortunate guests managed to smash their old personal bests. All in all, there were 8 great salmon landed over 30 pounds including the big 40 pounder. This does not include Mikhail’s and Michael’s honest 28 and 28.5 pounders on the final week or those 6 fresh osenkas up to 16 pounds or the 25 and 30 pounders that Volodya and I surely deserved fishing with our 9.5 foot - 7 weight rods off the middle Litza only hours after closing down the camps. The final total for last week was 131 salmon. Let’s face it. 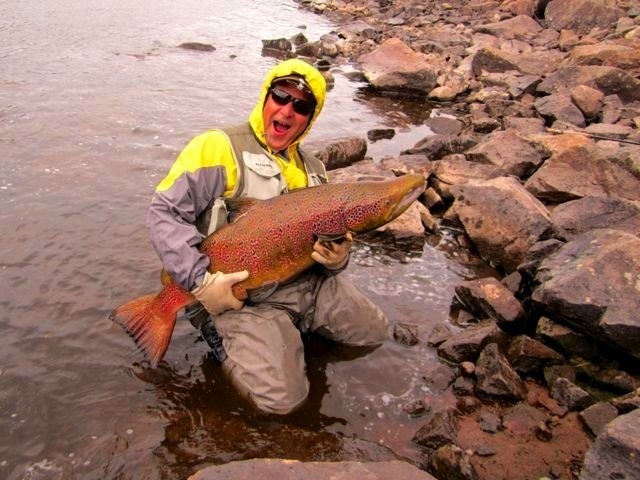 If there is one thing that all salmon fishermen have in common, it must be our passion for the really big fish. Returning this season again for round II, Mikhail wasted no time wrestling in his 33 pound P.B. only hours after arriving. From that moment on our friend seemed to be on cruse control going on to coax 14 more salmon into Vasiliy’s net including another memorable 28 pounder from the tricky Kharlovka rapids. Gary certainly seemed pleased with his 33 pounder as he lifted this amazing fat fish out of the Flat Stone pool like Elvis for the snapping paparazzi. You could definitely see the passion in Tore’s eyes when he stumbled back up the stairs stuttering about his last hour of the day over on the Litza – landing 16, 22 and 35 pounders! Yes indeed, it was truly sad to see this season finish! *Cheers – Skol – and Nastrovia!!! Did you realize that in addition to reducing the number of rods on the rivers this season and also considering the fact that we had a couple of smaller groups here to take advantage of those productive late July weeks, that overall, even though we had fewer guests than last season, they managed to land 163% more salmon per guest than they did the previous! *It should also be noted that there were 179 big fish over 20 pounds – 71 great salmon over 25 pounds – 31 that were greater 30 – 6 of those were larger than 35 pounds and one monster 40 pounder (was this 112cm X 71cm salmon the Biggest landed on the Kola this season?)! In addition, we’ve just received an encouraging report from Dima (fisheries scientist for PINRO) about the continued strength of parr densities. *The graphs will be published over the coming weeks. *Furthermore, we will be announcing some exciting news about extending our ASR protection programme outward to include the sea! We are currently in the process of finalizing our fishing plans for the 2013 season. ASR invitations and applications will be sent out by the end of next week. We are looking forward to fishing with you all again next season on the Northern Rivers!